The AR28 was first offered in 1999 as a chassis designed specifically for the 4-cycle market. To this day, each revision of the AR28 has been used to win U.S. and Canadian National 4-Cycle titles. Beginning in 2001, MRP's in-house race team began utilizing the kart, the AR28CX model, in the Rotax Junior category, scoring a US Rotax Junior title. By 2003, the chassis had evolved into the AR28CY, coming with new style bodywork and tailored still for the 4-cycle market, but also the Junior Sportsman categories as well. The chassis' success in Rotax Junior continued with an AR28 placing second at the 2004 US Rotax Grand Nationals. For 2006, the AR28Z was offered with a focus on the junior 2-cycle market. Sage Karam won a WKA Triple Crown using the chassis starting a string of success stories. Since 2006 several drivers have scored national championships using the AR28. Now, entering into 2011, the latest revision, the AR28Y, continues the model’s success with wins on the national tour already logged. 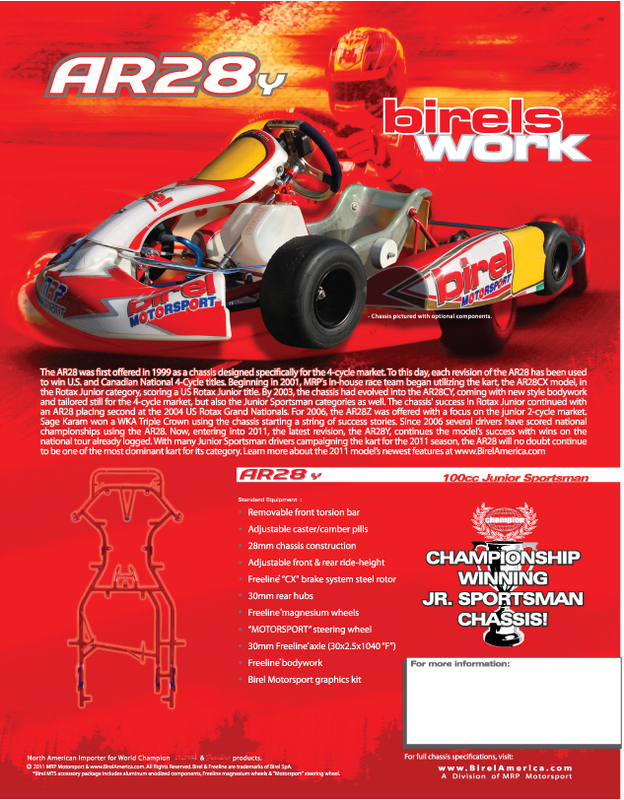 With many Junior Sportsman drivers campaigning the kart for the 2011 season, the AR28 will no doubt continue to be one of the most dominant kart for its category.